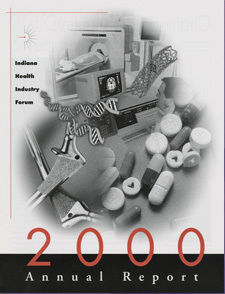 2000 was an eventful year for the Indiana Health Industry Forum. The 21st Century Research and Technology Fund took shape with the awarding of nearly $50 million in grants. They also stood back and surveyed their membership and other Indiana leaders about the Forum’s priorities and presence. They continued to raise awareness of the exciting achievements that their industry contributes to the Indiana economy. In July, Wade Lange joined the Forum as President, and William Loveday attended his final board meeting as the Forum’s Chairman.